The 10 Best Camping Spots in Illinois! Camping provides an escape from the daily grind and an opportunity to connect with nature. Illinois has thousands of acres of serene camping spots in a variety of terrains ranging from canyons to marshlands. 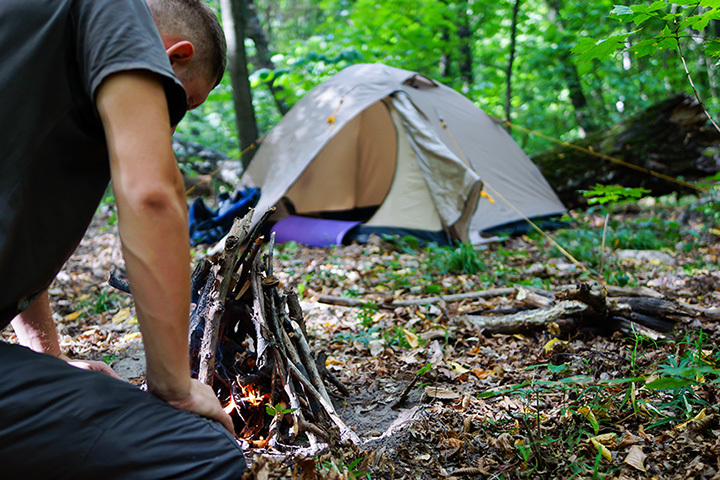 Whether you prefer rustic, primitive camping or more civilized camping spots equipped with modern luxuries, there are plenty of options in Illinois. The following camping spots are scenic and full of outdoor activities for the entire family. Starved Rock State Park is nothing short of a camper’s haven. Located around Oglesby, this gorgeous state park features towering trees, stunning canyons, beautiful waterfalls, and extraordinary views of flourishing nature. Campers have access to 13 miles of hiking trails, boating on the Illinois River, and 133 premium campsites equipped with electricity. There’s also plenty of RV hookups and open grassy spots ideal for pitching a tent. Apple River Canyon State Park offers scenic canyon areas, massive cliffs, and lush vegetation filled with a wide variety of wildlife. The Apple River Canyon has cut through the limestone for centuries, forging the current landscape and exposing numerous fossils. Campers are provided with nearly 50 campsites and six group sites. Winter camping is also available in this beautiful state park. Camp under the towering pines at White Pines Forest State park around Mt. Morris. This serene forest offers flowing streams, moss-covered cliffs, trailing vines, and ample wildlife watching for campers. Enjoy plenty of shaded picnic areas, seven marked hiking trails, cross-country skiing, and many other nature-filled activities year around. White Pines also offers over 100 campsites, youth group camping, and three electric hook-up sites. Horseback riding, fishing, hiking, and rock climbing are just some activities campers can enjoy at Giant City State Park near Makanda. This breathtaking state park features giant sandstone bluffs formed over 10,000 years ago. Campers can also take in the many varieties of towing trees, wildflowers, ferns, and mosses throughout the park. The well-kept campgrounds offer nearly 100 campsites, some of which are fully equipped with electricity, water, and sanitary facilities. More primitive campsites are also available. Experience a true natural wonder at Cave-In-Rock State Park. Named after a 55-foot-wide cave that overlooks the Ohio River, this awe-inspiring state park is the perfect weekend camping spot. Explore the park’s hiking trails and tranquil forests, plus access the Ohio River for boating, fishing, or watersports. Campers have over 30 fully-equipped campsites and 25 tent sites available. Explore over six miles of sandy shoreline and over 4,000 acres of natural beauty at Illinois Beach State Park. This beautiful natural setting is thriving with natural wildlife and hundreds of plant species. Campers can explore the sprawling marshes, oak forests, and wet prairies. The campground offers over 240 premium sites and three handicap-accessible sites. Castle Rock State Park is distinguished by rock formations, ravines, and a sandstone bluff perfect for exploration. Located in the Rock River Hills region, this beautiful park offers six miles of marked hiking trails, over a mile of bank fishing, and scenic picnicking. Camping at Castle Rock State Park is very rustic and ideal for campers who really want to experience nature up close, without modern luxuries. The primitive camping area is only accessible by boat or canoe. The Mississippi Palisades State Park is known for its limestone caves, steep cliffs, and intriguing rock formations. Rich in American Indian history, this 2,500-acre state park is teeming with wildlife including many bird species such as eagles, woodpeckers, and wild turkeys. There are over 240 campsites available and two youth camping areas. Fishing, rock climbing, boating, picnicking, and hiking trails are just some of the activities available for campers. Shawnee National Forest is rich in geological history and features many stunning panoramic views of rock formations. With two beach areas, rock climbing, fishing, boating, miles of diverse hiking, and ample sightseeing, campers have plenty of opportunities to connect with nature. Shawnee Forest also offers a variety of camping options ranging from primitive spots to a developed campground with electricity and showers. Enjoy spectacular views of the Illinois River, year-round recreational activities, local geology, and ample wildlife habitat at Pere Marquette State Park. This nature-lover’s paradise offers 12 miles of marked hiking trails, 20 miles of horse trails, bird watching, hunting, fishing, boating, and other outdoor activities. Camping opportunities are plentiful and include an 80-site campground equipped with electrical hookups, two cabins, a youth tent camping area, and organized group camps.